There are 241 items in the categories listed below. 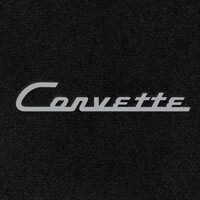 Why Lloyd Mats for your Corvette? The answer is easy; Top Quality! Signature Rubber is the only licensed custom fit, molded rubber emblem mat designed specifically for the C6 Corvette. Lloyd's stylish design prominently displays the combination C6 Flags and Corvette script in a mat that provides unparalleled style, protection and durability. Premium materials and innovative engineering have been combined to create this perfect blend of form and function. Lloyd uses the highest quality blend of natural and synthetic rubber to create the most durable, abrasion-resistant material. The multi-color C6 Corvette logo design is permanently molded in the mat, not laminated, to provide years of exceptional appearance. With this great look and performance, Lloyd's Signature Rubber is a mat for all seasons. 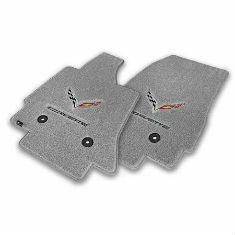 Lloyd Signature Series Floor and Cargo Mats are available for C6 Corvettes. Save money when ordering the floor mats and cargo mat together. Lloyd Corvette cargo mats are great compliments to the floor mats because they are offered in the same factory colors with matching logos. All cargo mats are manufactured with the same durable yet great looking material as the floor mats and will also protect your Corvette's rear hatch from bad weather. Lloyd Corvette cargo mats are guaranteed to fit perfectly in the rear hatch and will only add to the overall presentation of your Corvette. RubberTite custom fit all weather mats are like no other protection available for your Corvette. This material from Lloyd Mats provides the capacity to hold water, mud, snow, spills, sand, dirt and other debris, without the bulky side walls of other trays and liners. The heavyweight composition rubber stays flexible even in sub-freezing temperatures and has a textured, non-slip surface for additional safety. Easy to clean with the spray from a hose. Available in Black, Grey, Tan or Clear. You can get all weather protection for your Corvette without a commercial rubber appearance. Our clear vinyl Protector Mats keep your vehicle's carpeting dry, while letting the vehicle's carpet color and texture show through. 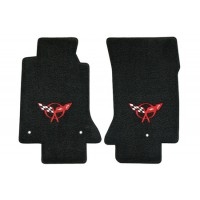 These durable mats are die cut to fit your Corvette specifically, not a generic replacement. Clear protector mats include factory style attachment points and aggressive vinyl nibs that keep these mats in place. Their textured surface provides non-slip safety. Important For 2007 C6 Owners: General Motors made a change to the floor mat anchoring device in 2007 Corvette models. The attached document shows the two different pre-installed anchors used in 2007 Corvettes. In order to supply the correct floor mats for your Corvette, please identify the device found in the floor of your vehicle as either the "Post" or "Hook" anchor. This will determine if you have an '07E (Early) or an '07L (Late). Please order your floor mats accordingly. Click for more info on 2007 C6 Corvette Floor Mat Anchoring. Important For 2013 C6 Owners: Two of the three Factory mat anchor hooks mounted to the original floor in the 2013 Corvette changed location midway through the 2013 production year. The easiest way to determine if you need early or late production floor mats is to check the location of the single hook in the passenger seating area. Lay a ruler flat on the passenger side floor and measure the distance from the center of the anchor hook to where the door sill starts to slope upward. See the photos in the document below for early and late hook placement locations. Click for more info on 2013 C6 Corvette Floor Mat Anchoring. Year after year, Lloyd Mats produces the finest quality custom made Corvette floor and cargo mats available. By taking advantage of modern technology, they are able to produce the most durable, best looking and best fitting floor & cargo mats for your Corvette. Depending on what style Corvette floor mat you are looking for, you can choose from several different options including: Single emblem design (Corvette emblem), Double emblem design (Corvette emblem + "Corvette" script), Z06 emblem, ZR1 Emblem, Corvette Racing Script, Jake Corvette Racing Emblem, Grand Sport Emblem, 60th logo, Floor Mat Color and Emblem Color. For added interior carpet protection, look to our clear Corvette Protector Mats, Rubbertite Floor Mats or Signature Rubber Floor Mats. All of which will fit perfectly like any Lloyd product and keep your Corvette interior protected from dirt, debris and other undesired elements.